The Driver Feedback Sign DFS 700 is designed for areas with high pedestrian activity where safety is an issue and encourages drivers to reduce their speeds to help protect all road users and pedestrians. It also provides valuable reporting data to help you monitor its impact, and to demonstrate that targets are being met. Lee Benham of Newport City Council states: "A DFS 700 is quick and easy to install, and immediately effective in cutting down speeds." Optional GSM for long distance wireless data connection from your office. Radar Power: 20 dBm, 100 mW e.i.r.p. 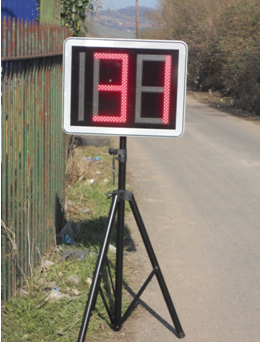 Standard Signs have developed the DFS 600 to be an ideal solution for short term “community speed watch” projects which require a light weight, easy to operate sign which educates drivers to reduce speed in sensitive areas. The sign has a small battery box fitted to the rear and can be easily mounted on a lightweight tripod for short term speed monitoring.